A test car is driving toward a solid crash-test barrier with a speed of 45 mi/h. Two seconds prior to impact, the car begins to brake, but it is still moving when it hits the wall. After the collision with the wall, the car crumples somewhat and comes to a complete stop. In order to estimate the average force exerted by the wall on the car, what information would you need to collect? The (negative) acceleration of the car before it hits the wall and the distance the car travels while braking. The (negative) acceleration of the car before it hits the wall and the velocity of the car just before impact. The velocity of the car just before impact and the duration of the collision with the wall. 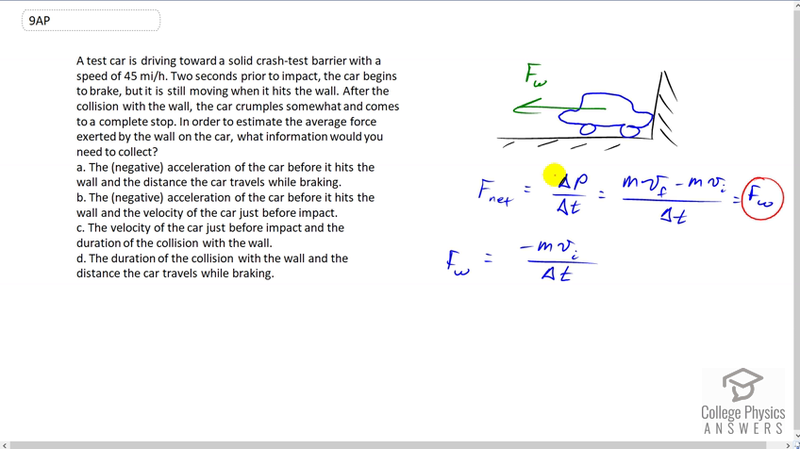 The duration of the collision with the wall and the distance the car travels while braking. This is College Physics Answers with Shaun Dychko. When the car impacts the wall, there will be only one force horizontally and that'll be the force due to the wall which makes it the net force. Net force is change in momentum over change in time and we can expand change in momentum and write it as mass times final velocity minus mass times initial velocity. The final velocity of the car will be zero because it is brought to a stop and this mean the force exerted by the wall will be negative mass of the car times its initial velocity just before impact, divided by the duration of the impact. So the answer is C.